In the lead up to Christmas we took part in an appeal to help raise money and provide toys to children who were at risk of receiving no Christmas presents at all. Can you imagine your children waking up on Christmas day to nothing? We didn’t like the idea of that either so we offered our help to Key103’s Cash For Kids appeal, opening up our office as a drop off point for people making donations. We all got together, dug deep and made a sizeable donation ourselves. Being located in the thriving City Centre of Manchester we managed to receive quite a few more donations from people who were around and decided to use us as their drop off point of choice. But the picture is bigger than that of our efforts. All over Manchester businesses were opening their pockets and their doors making and receiving donations every day to help put a toy in a child’s stocking who, otherwise, would have gone without. From small local businesses to the likes of John Lewis and O2, the Christmas Spirit was in plentiful supply with companies clubbing together in this great mission, to make a happy Christmas for all children, a success. And success was achieved. 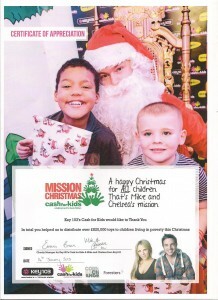 With over £820,000 worth of toys distributed to children living in poverty. This was a great effort by all involved and as a token of this collaboration we received a special thank you message from Key103.